Pulling apart a good comic is like trying to figure out the secret ingredients in a great dish. You have to go on taste and feel alone. The dish's sharp bite could be basil or pepper, and the juicy taste could be thanks to primo meat or a long-term brine. You'll never know for sure, but trying to figure it out? That's a lot of fun. 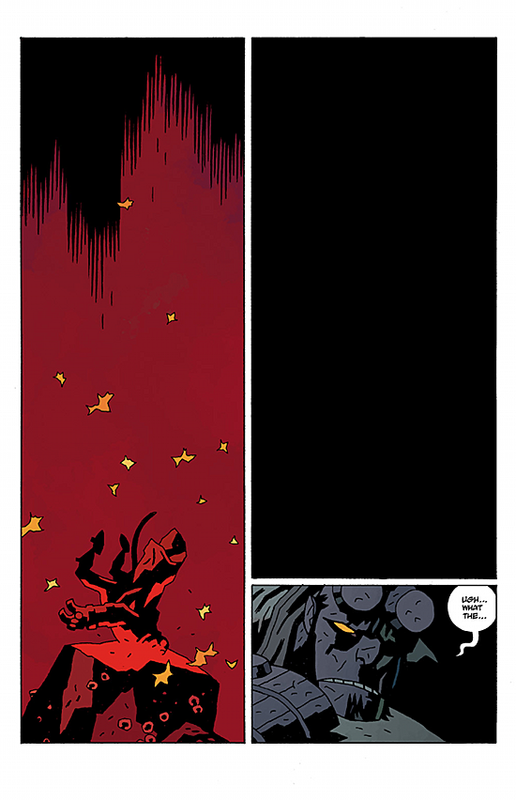 I read Hellboy In Hell -- impeccably drawn by Mike Mignola, fantastically colored by Dave Stewart, and wonderfully lettered by Clem Robins -- and was struck by how Mignola chose to tell that story. There's something weird about it, a little off-kilter, and I realized that's true of a lot of his Hellboy stories. I want to crack this puzzle, and I think I narrowed down two of the main ingredients in Hellboy in Hell: atmosphere and comedy. You could say that Hellboy in Hell is "atmospheric" and leave it at that, but that's no fun. It's maddeningly vague, isn't it? What atmosphere is it evoking? "Horror" isn't a good answer. I've never found Hellboy all that scary. Heart-rending, sure, but that's not an atmosphere exactly. I think we need to take a deeper look past the surface level and see what the art suggests. Every line was laid with a purpose, so we should begin by trying to discover that purpose. What does Hellboy in Hell feel like? Even when it's open and airy, it's dark and cramped. There aren't any blue skies or sunny days, just shadows with monsters waiting for their chance to strike. It isn't that danger lurks in every shadow so much as each shadow is a danger all its own. You don't get a chance to catch your breath or collect yourself. You have to keep going. 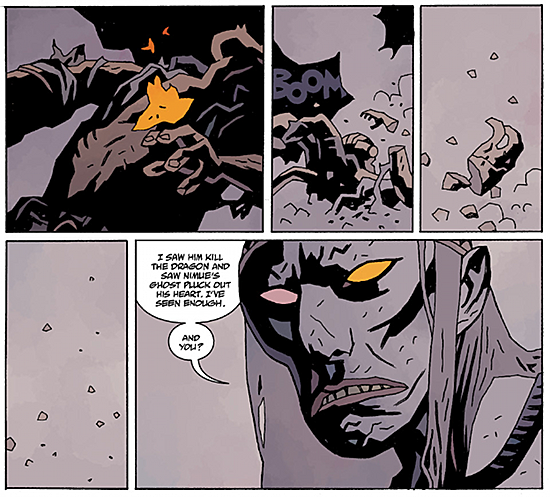 Hellboy in Hell feels like the story of a man that is lost and on the verge of being crushed by an unavoidable weight. That sounds about right to me. But why? 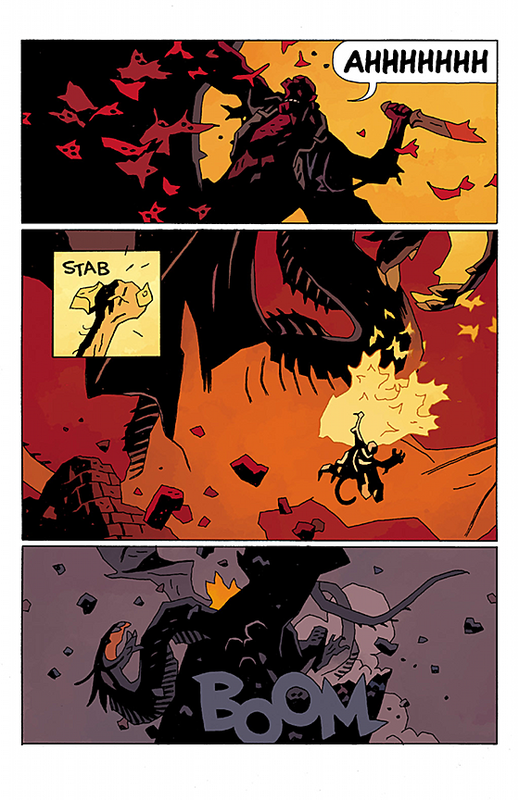 Mignola does this thing I like a lot, and other artists who've drawn Hellboy have picked up on it. He'll throw in inset panels of strange details into the middle of a story. It has the effect of drawing your eye, and attention, to that specific action. It becomes part of the tapestry in a way that a punch or kick to the face of a giant monster doesn't. As a result, that action is magnified in your mind. It seems more important, because otherwise why else would Mignola focus on it? So you pay a little more attention to it, unconsciously perhaps, as you move through the book. He also likes to take a single action and stretch it out over the course of a few panels. (Don't tell anyone, but that's how decompressed storytelling works. It ain't just making a story six issues long.) 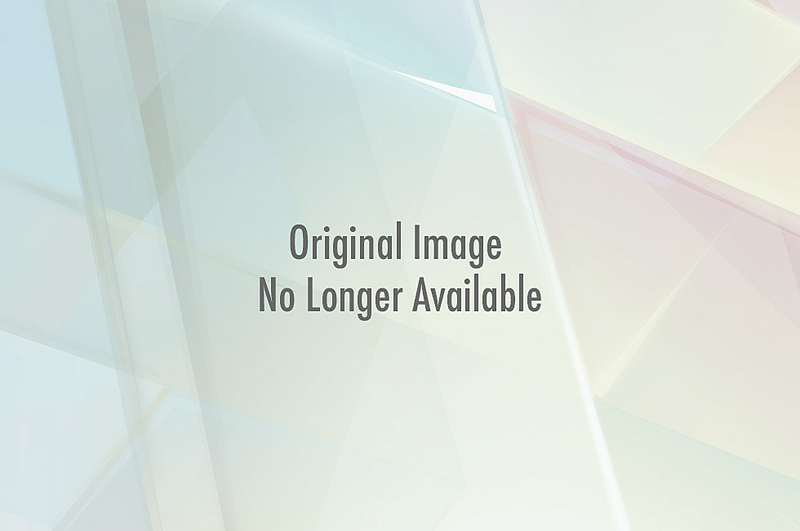 This has a similar effect as the inset panels, though instead of taking in one image, you're now focusing on one event. When you see Hellboy crumble to dust, it's not just a single moment in time. It's a moment that has been stretched over a period of time. You see Hellboy go from a being to mere dust in the wind. The importance of the scene is communicated by how much real estate Mignola dedicates to it, and this is obviously a tremendously important scene, right? Mignola's got a few other tools in his box. He'll use a tall black panel to indicate not just the passage of time, but the passage of an unknown amount of time. The kind of time that passes when you aren't paying attention, leaving you unaware and discombobulated. He'll show you a panel with something, a hand or a sound effect, that won't mean anything until later in the book. Is this friend or foe? Where is that ticking coming from? It's about wanting to escape from sadness by giving up yourself, your memories, and your life. It's also an apt poem to connect to Hellboy in Hell. Proserpine, or Persephone, was kidnapped and taken to the underworld to be the bride of the ruler. If you know a little bit about a little bit, then that single panel takes on a sinister tone beyond its fearsome face. Mignola isn't beating you over the head with it -- I'm bringing my experience with Keats to Hellboy in Hell, not vice versa -- but it's there, if you're willing to let your mind dial in. And once you dial in? You're trapped. You want to know what it means and how it relates. It unsettles you. Hellboy in Hell wants you to be just as dazed and trapped as Hellboy. Mignola isn't going to spell things out for you. Even the exposition is shrouded. You just need to pay attention, keep moving, and trust that you've made the right decision. Mignola is intentionally putting you off-balance while simultaneously avoiding spelling out where his story is going. Does that add up to feeling lost and compressed? I think it does. Okay, so let's say Mignola has built up this foreboding and claustrophobic atmosphere, one where Hellboy is beset on all sides by the slings and arrows of demons and worse. That makes Hellboy in Hell something that could be skin-crawlingly creepy. There would be a firm and easily identifiable strain of "This is wrong" running through the book. That would be impressive work. Scary comics are few and far between, and properly done creepy ones even rarer. But, the second ingredient is comedy. The proper Hellboy tone is somewhere between Benjamin J Grimm and John McClane. He's not Spider-Man, but he's not exactly reverent, either. He's an American action hero, through and through. Even when he's confused, he's ready for a bit of pointed humor or self-deprecation. Hellboy in Hell is as irreverent as Hellboy himself. The recap quickly recounts Hellboy's history before saying, "Shortly thereafter he fought a dragon and was killed." It's glib, undeniably glib, but it fits. It fits the tone of the series and the character. There are amazing things happening everywhere, but Hellboy, a regular guy despite going up against tremendous forces that attempted to transform him into anything but, has kept his sense of humor and confidence. On the page after, as a segue into the story at hand, the Baba Yaga simply says, "I never liked him, but even I have to admit he ended well." 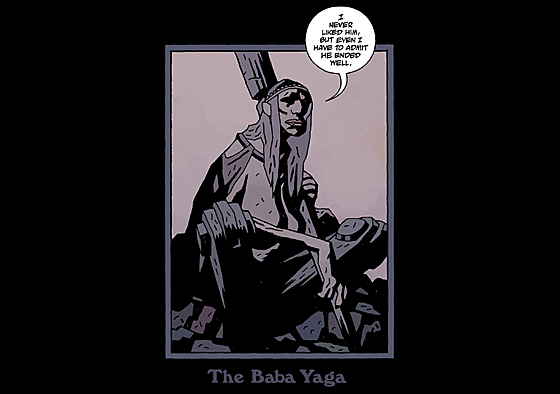 The way Mignola drew the Baba Yaga on the page -- framed in a tall rectangle, her name printed below, the only element on the page -- reminds me of nothing more than an E! True Hollywood Stories interview, or a particularly catty documentary about a rock star. "I didn't like him, but he could play guitar, you know?" Is that any kind of epitaph for a man who just saved the world? Apparently so. The jokes continue as the issue goes on. The tall black panel comes about because Hellboy fell down a hole and hit his head on a rock and got knocked out. Later, after waking up, he asks someone where he is. After being told exactly where he is, he replies "Oh. Sorry I asked." Still later, while being menaced by a giant dude with an even bigger hammer, Hellboy lets him know that he's "got the wrong guy, pal." Hellboy died hard, huh? Yeah. Hellboy in Hell isn't laugh out loud funny. It isn't that kind of comic. But Mignola definitely punctures the gloomy atmosphere with a lead character who can't help but take the proceedings half-seriously. You get the feeling that Hellboy does a lot of grimacing and sighing when it comes to getting the job done. He's the type of guy who would say "This again?" when faced with floating vampiric heads and "C'mon, seriously? We have to go through this?" when he battles a giant troll. It's a weird choice for a comic that could easily dip into full horror, isn't it? 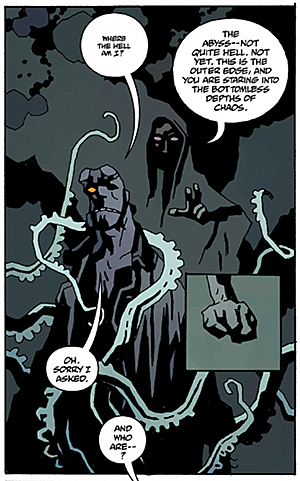 How do you reconcile Hellboy in Hell's creepy aspects and funny aspects? On paper, they don't seem like something that would work well together. A hero who keeps making fun of his predicament? What sense does that make? It makes perfect sense if you look at it like this: Hellboy in Hell #1, and most Hellboy comics, are adventure comics first and foremost. The comedy keeps us firmly on the fun side of things. Mignola gives us something we can recognize as being scary, but instead chooses to show us the action-oriented side of things, rather than going for skin-crawlingly horrible terror. But the atmosphere is a veiled threat. It's a statement. "This can stop being funny at the drop of a hat." Mignola can throw Hellboy into the pit, shut it and seal it over him, and you can't do anything about it. By that point, you're well along for the ride and have no hope of turning back. When Hellboy stops being funny, everything hurts. 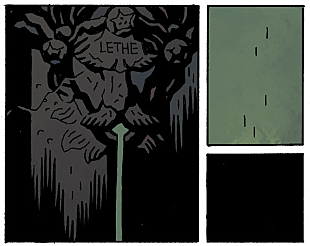 Hellboy in Hell is great. It's mean and packed and funny in all the right ways... but after I finished it, I couldn't help but find myself wondering how Mignola is going to rip my guts out this time. Dig into it a little and see how it makes you feel. You can buy it now.